Over the last decade, integrin αvβ3 has been studied with every single molecular imaging modality. Since no single modality is perfect and sufficient to obtain all the necessary information for a particular question, combination of certain molecular imaging modalities can offer synergistic advantages over any modality alone. This review will focus on multimodality imaging of integrin αvβ3 expression, where the contrast agent used can be detected by two or more imaging modalities, such as combinations of PET and optical, SPECT and fluorescence, PET and MRI, SPECT and MRI, and lastly, MRI and fluorescence. Most of these agents are based on certain type(s) of nanoparticles. Contrast agents that can be detected by more than two imaging modalities are expected to emerge in the future and a PET/MRI/fluorescence agent will likely find the most future biomedical/clinical applications. Big strides have been made over the last decade for imaging integrin αvβ3 expression and several PET/SPECT probes have been tested in human studies. For dualmodality and multimodality imaging applications, a number of proof-of-principle studies have been reported which opened up many new avenues for future research. The next decade will likely witness further growth and continued prosperity of molecular imaging studies focusing on integrin αvβ3, which can eventually impact patient management. The field of molecular imaging has flourished over the last decade, and perhaps the best example is integrin αvβ3-targeted imaging [1, 2]. Generally, molecular imaging techniques include positron emission tomography (PET), single-photon emission computed tomography (SPECT), molecular magnetic resonance imaging (mMRI), magnetic resonance spectroscopy (MRS), targeted ultrasound, optical bioluminescence, and optical fluorescence [3, 4]. Many hybrid systems that combine two or more of these imaging modalities are also commercially available and certain others are under active development [5-7]. Over the last decade, integrin αvβ3 has been studied with every single molecular imaging modality and many comprehensive reviews have been published [1, 2, 8, 9]. As the key member of a family of cell adhesion molecules, integrin αvβ3 binds to Arginine-Glycine-Aspartic acid (RGD)-containing components of the interstitial matrix such as vitronectin, fibronectin and thrombospondin . Besides playing an important role in many normal physiological processes [11, 12], integrin αvβ3 is also overexpressed in a number of tumor types such as melanoma, late stage glioblastoma, ovarian, breast, and prostate cancer [8, 13, 14]. For optical imaging, RGD peptides or their mimetics have been conjugated with a variety of contrast agents such as near-infrared (NIR, 700 - 900 nm) fluorescent dyes [15-18], quantum dots (QDs) , and carbon nanotubes [20-22]. Contrast-enhanced ultrasound imaging of integrin αvβ3 has been investigated with both microbubble-based agents [23, 24] and perfluorocarbon nanoparticles . For mMRI of integrin αvβ3 expression, Gd3+-containing paramagnetic liposomes , perfluorocarbon nanoparticles [27, 28], polymers , as well as iron oxide (IO)-based agents  have all been employed. The mainstay of molecular imaging of integrin αvβ3 expression is with SPECT and PET techniques, which has been extensively investigated by many research groups around the world and many excellent review articles are available [1, 31-33]. Among all molecular imaging modalities, no single modality is perfect and sufficient to obtain all the necessary information for a particular question (Table 1). For example, it is difficult to accurately quantify fluorescence signal in living subjects based on fluorescence imaging alone, particularly in deep tissues; MRI has high resolution and exquisite soft tissue contrast yet it suffers from very low sensitivity; Ultrasound is more widely available yet targeting with microbubbles is mainly limited to the vasculature; Radionuclide-based imaging techniques are very sensitive and highly quantitative but they have relatively poor spatial resolution. Combination of certain molecular imaging modalities can offer synergistic advantages over any single modality alone, and the “killer” combination would depend on the specific goal of a particular study. A brief comparison of the various techniques for in vivo molecular imaging. Multimodality imaging of integrin αvβ3 using a small molecule-based probe is very challenging, sometimes impossible, due to the limited number of conjugation sites and the potential interference with its receptor binding affinity. Nonetheless, this approach has been undertaken and will be briefly illustrated in this review. On the other hand, nanoparticles have large surface areas where multiple functional moieties can be attached for multimodality molecular imaging . Nanotechnology, an interdisciplinary research field involving physics, chemistry, engineering, biology, and medicine, has great potential for future personalized treatment of diseases including cancer [35, 36]. Nanoparticles are typically smaller than several hundred nanometers, comparable to the size of large biological molecules such as enzymes, receptors, and antibodies. With sizes of about 2-4 orders of magnitude smaller than human cells, these nanoparticles can offer unprecedented interactions with biomolecules both on the surface of and inside the cells, which may revolutionize medical diagnosis and patient treatment. To date, the majority of multimodality imaging studies of integrin αvβ3 expression involves certain type(s) of nanoparticles. This review will focus on multimodality imaging of integrin αvβ3 expression, where the contrast agent used can be detected by two or more imaging modalities. Comparing to the vast number of literature reports on imaging integrin αvβ3 with a single modality, dualmodality or multimodality imaging of integrin αvβ3 is still in its infancy and there are only a small number of reports available to date. Most of these are proof-of-principle studies and there is still ample space for improvement in the future. PET has been widely used in the clinic for staging and evaluating many types of cancer . The recently developed PET/CT scanner, already being used on a routine basis in clinical oncology, greatly aids in the localization of regions of increased activity on PET [5, 38]. The combination of PET and fluorescence imaging, although not widely clinically relevant, can provide complimentary information in small animal models where light penetration is less of an issue. Over the past decade, QDs have become one of the fastest growing areas of research in nanotechnology [39-41]. For in vitro applications, these wonderful semiconductor fluorescent nanoparticles can be used in place of traditional organic fluorescent dyes in virtually any system, outperforming organic dyes in the majority of cases. In vivo targeted tumor imaging with biocompatible QDs has also been achieved in mouse models [19, 42, 43]. However, due to the difficulty in quantifying the fluorescence signal in vivo and many other technical challenges which remain to be solved, in vivo imaging of QDs is mostly qualitative or semi-quantitative [39, 40]. Development of a dualmodality agent containing both an NIR QD and a PET isotope will allow for sensitive, accurate assessment of the pharmacokinetics and tumor targeting efficacy of NIR QDs by PET, which may greatly facilitate future translation of QDs into clinical applications. We reported a QD-based probe for both NIR fluorescence (NIRF) and PET imaging of integrin αvβ3 expression . Cyclic RGD peptides and DOTA (i.e. 1,4,7,10-Tetraazacyclododecane-1,4,7,10-tetra acidic acid) chelators were conjugated to a QD (maximum emission: 705 nm) for integrin αvβ3-targeted, dualmodality PET/NIRF imaging of tumors in living mouse after 64Cu-labeling (Figure 1). Using this agent, we quantitatively evaluated the tumor targeting efficacy. Moreover, this PET/NIRF probe can confer sufficient tumor contrast detectable by PET at much lower concentration than that required for in vivo NIRF imaging , thus significantly reduces the potential toxicity of cadmium-based QDs and may facilitate future biomedical applications [45, 46]. Histological examination revealed that the agent targets primarily the tumor vasculature via RGD-integrin αvβ3 interaction with little extravasation. Taken together, combining PET and NIRF imaging overcomes the tissue penetration limitation of NIRF imaging, allowing for quantitative in vivo targeted imaging in deep tissue. Such information will be crucial for fluorescence-guided surgery through sensitive, specific, and real-time intra-operative visualization of the molecular features of normal and diseased processes. Single-walled carbon nanotubes (SWNTs) exhibit unique size, shape and physical properties that make them promising materials for biological/biomedical applications [22, 47, 48]. We investigated the biodistribution of 64Cu-labeled SWNTs in mice by PET, ex vivo biodistribution, and Raman spectroscopy . These SWNTs were highly stable in vivo and the surface polyethylene glycol (PEG) chain length could significantly affect their blood concentration and biodistribution. Effectively PEGylated SWNTs exhibit relatively long circulation half-life (about 2 h) and low uptake by the reticuloendothelial system (RES). Efficient targeting of integrin αvβ3-positive tumor in mice was achieved with SWNTs coated with PEG chains linked to cyclic RGD peptides . Most importantly, the intrinsic Raman signatures of SWNTs were used to directly probe the presence of SWNTs in mice tissues and confirm the radionuclide-based imaging results. Radiolabeled nanoparticles represent a new class of probes which has enormous potential for clinical applications. Different from other molecular imaging modalities where typically the nanoparticle itself is detected, radionuclide-based imaging detects the radiolabel rather than the nanoparticle. The nanoparticle distribution is measured indirectly by assessing the localization of the radionuclide, which can provide quantitative measurement of the tumor targeting efficacy and pharmacokinetics only if the radiolabel on the nanoparticle is stable enough under physiological conditions. However, dissociation of the radionuclide (typically metal) from the chelator, and/or the radionuclide-containing polymer coating from the nanoparticle, may occur which can cause significant difference between the nanoparticle distribution and the radionuclide distribution. Direct measurement of the nanoparticle itself, as well as rigorous validation of the stability of the radiolabel on the nanoparticle, should always be carried out to obtain more reliable experimental results. Recently, directed evolution was employed to engineer knottin peptides that bind to various integrins with high affinity . 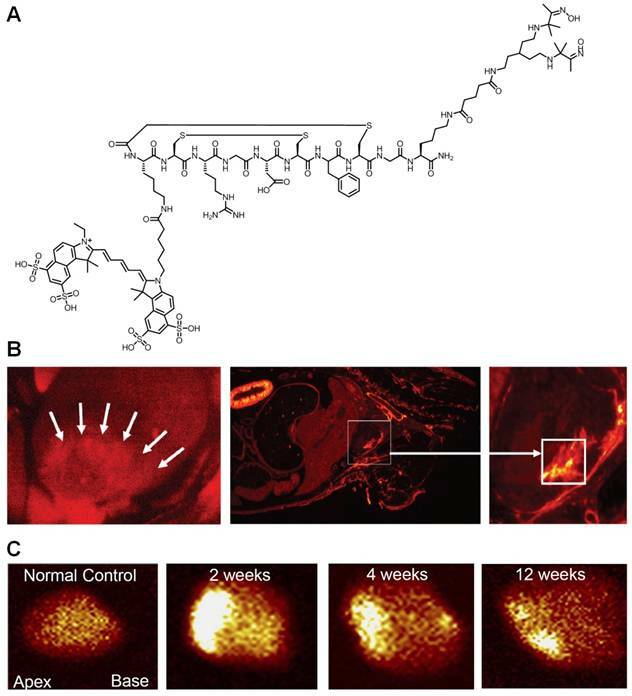 To evaluate these peptides as molecular imaging agents, Cy5.5 or DOTA was site-specifically conjugated to their N termini for PET and fluorescence imaging of integrin αvβ3 in a U87MG human glioblastoma model . Both NIRF and PET imaging showed that integrin binding affinity played an important role in the tumor uptake of knottin peptides, where high-affinity knottin peptides had higher tumor uptake than the low-affinity knottin peptides. Although only one image tag can be attached to each knottin peptide, this study did demonstrate the potential of these knottin peptides as a platform for potential multimodality imaging of integrin αvβ3 expression where different image tags can be readily incorporated, using similar chemistry, for different applications. In another recent report, ferritin nanocages were loaded with RGD peptides, Cy5.5 and 64Cu ferritin for integrin αvβ3-targeted PET/NIRF imaging . Unlike traditional conjugation methods, such a loading strategy minimizes the interference among different docked motifs and enables accurate control over the composition of the final conjugates, which may have implications for future construction of multimodal imaging probes and nanoparticles-based theranostics. Dualmodality imaging of integrin αvβ3 on tumor vasculature with PET and fluorescence. A. A schematic structure of the dualmodality PET/NIRF probe. B. Fluorescence (after injection of QD-RGD) and coronal PET (after injection of 64Cu-DOTA-QD-RGD) images of integrin αvβ3-positive U87MG tumor-bearing mice. Arrowheads indicate the tumors. 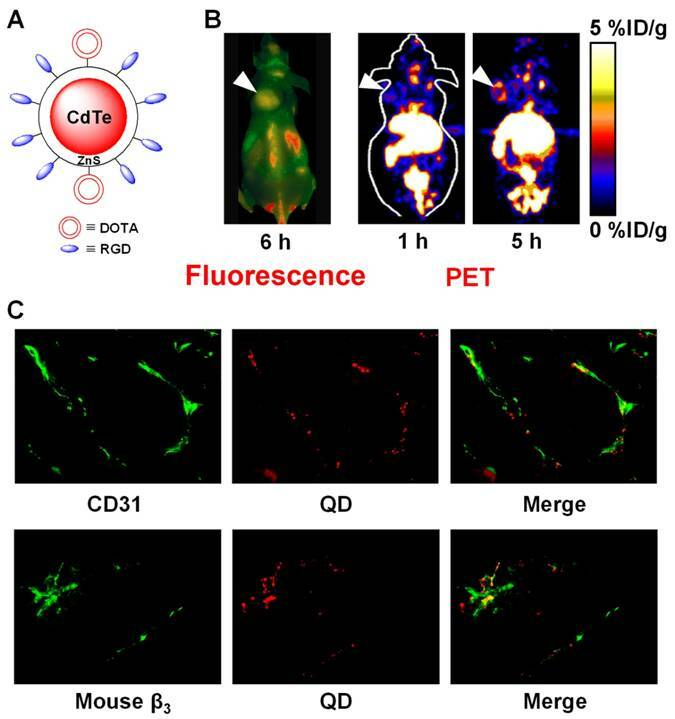 C. Excellent overlay between CD31 and QD fluorescence, as well as between murine β3 and QD fluorescence, confirmed that DOTA-QD-RGD mainly targeted integrin αvβ3 on the tumor vasculature. Adapted from . A RGD peptide was labeled with 111In and IRDye800 (maximum emission: 800 nm) for gamma scintigraphy and continuous-wave imaging of integrin αvβ3-positive M21 melanoma xenografts, respectively . Twenty-four hours after administration of the agent at a dose equivalent to 90 μCi of 111In and 5 nmol of IRDye800, whole-body gamma scintigraphy and optical imaging was conducted. It was found that while the target-to-background ratios of gamma scintigraphy and optical imaging were similar for superficial regions-of-interest, consistent with the origin of gamma and NIRF signal from a common targeted agent, the signal-to-noise ratio (SNR) was significantly higher for optical than radionuclide imaging. Analysis of SNR versus contrast also showed that optical imaging had greater sensitivity for subcutaneous tumor targets. However, such an advantage quickly diminishes when the tissue of interest gets deeper under the skin (> a few mm). Since fluorescence-mediated tomography is still not a mature technology [54, 55], accurate comparison between the two modalities was not feasible. Nonetheless, this proof-of-principle study demonstrated for the first time the direct comparison of optical and planar radionuclide imaging for superficial and sub-surface tumors. In a follow-up study, the same probe was used for non-invasive detection of αvβ3-positive tumors in living mice with both optical imaging and gamma scintigraphy . Similar as what was reported previously, optical imaging provided better resolution and more sensitive detection of the superficial lesions while gamma scintigraphy allowed for more sensitive detection of deeper structures. The major drawback of this SPECT/NIRF agent is that comparing to the size of the monomeric RGD peptide, the 111In-DTPA (i.e. diethylene triamine pentaacetic acid) complex and the fluorescent dye are both relatively bulky and can significantly affect receptor binding. The reason why the imaging studies were carried out at 24 hours after injection for such a low molecular weight agent, which usually gets cleared from the circulation and non-targeted organs within minutes or hours, was also unclear. A radioisotope with a shorter half-life should be more suitable for such small molecule-based agent, which can significantly reduce the unnecessary radiation exposure to non-targeted organs. To image the expression pattern of tumor integrin αvβ3 through a multimodality imaging paradigm, a RGD peptide analogue (termed “LS308”) bearing both DOTA and a lipophilic NIRF dye (cypate) was constructed . In vivo distribution of 111In-labeled LS308 in tumor-bearing mice was studied by fluorescence, bioluminescence (the tumor cells were transfected with luciferase), planar gamma, and SPECT imaging, which revealed that LS308 selectively accumulated in integrin αvβ3-positve tumors in a receptor-specific manner and could be non-invasively visualized by various imaging modalities. The reports described above were primarily focused on cancer. Although integrin αvβ3 is one of the key players in tumor angiogenesis and metastasis, it is also important in many other angiogenesis-related diseases such as inflammation , myocardial infarction (MI) [59, 60], atherosclerosis , among others [11, 12]. One recent study evaluated interstitial alterations in myocardial remodeling using a radiolabeled Cy5.5-RGD peptide (termed “CRIP”) that targets myofibroblasts . The rationale of this study was that since collagen deposition and interstitial fibrosis contribute to cardiac remodeling and heart failure after MI, evaluation of myofibroblastic proliferation should provide indirect evidence of the extent of fibrosis. 99mTc-labeled CRIP was injected in mice after coronary artery occlusion. Maximum CRIP uptake was observed in the infarct area and peaked at about 2 weeks after surgery, which was histologically traced to myofibroblasts (Figure 2). More importantly, the experimental findings from both SPECT and fluorescence imaging corroborated quite well. It was suggested that this strategy, if proven clinically feasible, would help identify post-MI patients likely to develop heart failure. Accurate localization of PET probe uptake, even with PET/CT, can be very difficult in some cases due to the absence of identifiable anatomical structures, particularly in the abdomen [63, 64]. Combination of PET/MR can have many synergistic effects. In addition to the exceptional soft tissue contrast of MRI, highly accurate image registration can offer the possibility of using the MR image to correct for PET partial volume effect and aid in PET image reconstruction. Moreover, PET/MR has greatly reduced radiation exposure compared with PET/CT. Prototype PET/MR systems have been implemented for small animal imaging and preliminary data for human studies have also been presented [7, 65]. PET/MR, acquired in one measurement, has the potential to become the imaging modality of choice for various clinical applications such as neurological studies, certain types of cancer, stroke, and the emerging field of cell-based therapy. The future of PET/MR scanners will greatly benefit from the development of dualmodality PET/MR imaging agents. Dualmodality imaging of integrin αvβ3 with SPECT and fluorescence. A. A RGD peptide is conjugated to both Cy5.5 and a chelating agent for radiolabeling with 99mTc. B. After intravenous administration of the probe, localization of the Cy5.5 fluorescence (red) was observed in the infarct and peri-infarct zones in live animals at 2 weeks post-myocardial infarction (MI). A whole mouse slice also demonstrated myocardial uptake of the probe (square). C. Ex vivo images of the explanted hearts in control and post-MI animals after probe injection. Intense uptake was seen in 2-week post-MI animal. Adapted from . An IO-based probe for PET/MR imaging of tumor integrin αvβ3 expression has been reported . Poly(aspartic acid)-coated IO nanoparticles (PASP-IO) were prepared and the surface amino groups were coupled to cyclic RGD peptides for integrin αvβ3 targeting and DOTA chelators for PET imaging (after labeling with 64Cu), respectively. The PASP-IO nanoparticle had a core size of 5-7 nm with a hydrodynamic diameter of ~40 nm. 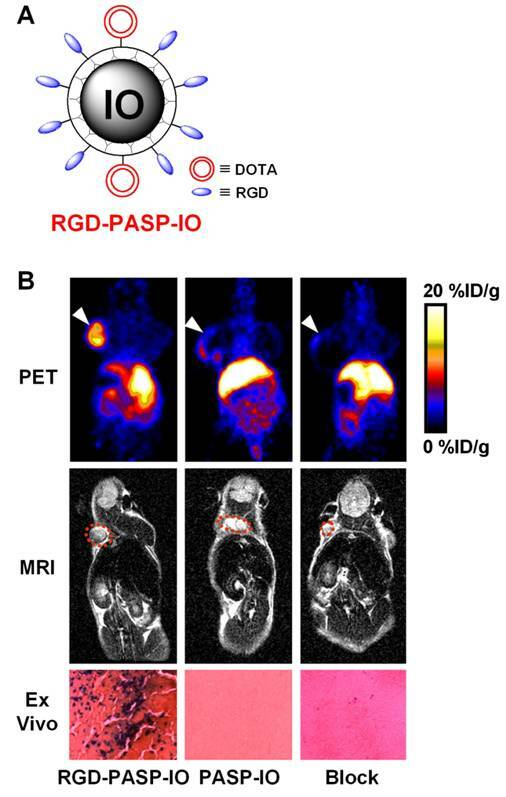 Based on PET imaging, the tumor accumulation of 64Cu-labeled RGD-PASP-IO peaked at about 4 h post-injection while the non-targeted particle, 64Cu-DOTA-IO, had significantly lower tumor uptake (Figure 3). Blocking experiment with unconjugated RGD peptides significantly reduced the tumor uptake of the dualmodality agent, thus demonstrating receptor specificity in vivo. T2-weighted MRI corroborated the PET findings. After in vivo PET and MRI scans, the animals were sacrificed and Prussian blue staining of the tumor tissue confirmed integrin αvβ3 specific delivery of the RGD-PASP-IO nanoparticles. Similar as most other nanoparticle-based imaging agents [67, 68], the RES uptake of this probe was also quite prominent. Overall, good correlation between the in vitro, in vivo and ex vivo assays demonstrated that the non-invasive imaging results accurately reflected the probe biodistribution. This study represents the first example of in vivo dualmodality PET/MR imaging using a single agent. An IO nanoparticle-based dualmodality PET/MR agent. A. A schematic illustration of the dualmodality probe. The DOTA chelator enables PET imaging after 64Cu-labeling. B. Coronal PET and T2-weighted MR images of tumor-bearing mice at 4 h after injection of 64Cu-labeled RGD-PASP-IO, PASP-IO, and RGD-PASP-IO mixed with unconjugated RGD peptides (denoted as “Block”). Prussian blue staining of the U87MG tumor (integrin αvβ3-positive) tissue slices after scanning is also shown, where blue spots indicate the presence of IO nanoparticles. Adapted from . One recent study focused on the development of a dualmodality, integrin αvβ3-targeted, nanoparticle-based imaging agent that affords sensitive nuclear detection in conjunction with high-resolution MR characterization of tumor angiogenesis , with the ultimate goal of improving patient risk-benefit stratification. New Zealand white rabbits bearing Vx2 tumors received 99mTc-labeled, integrin αvβ3-targeted nanoparticles at different doses and were imaged with both planar gamma camera imaging and SPECT/CT. MR sensitivity was incorporated into the nanoparticles by inclusion of lipophilic Gd-chelates into the outer phospholipid layer. It was found that the tumor-to-muscle contrast ratio, after injection of the nanoparticle, was dose-dependent and receptor-specific. More importantly, the use of 99mTc-labeled targeted nanoparticles produced a clear neovasculature signal from the tumor that was detected with SPECT/CT. MRI and 3D mapping of angiogenesis in the small tumor revealed an asymmetrically distributed, patchy neovasculature along the periphery of the tumor. It was suggested that these nanoparticles can afford highly sensitive and specific localization of tumor angiogenesis, which can be further characterized with high-resolution MR neovascular mapping to predict responsiveness to anti-angiogenic therapies. Among all the dualmodality imaging agents reported to date, combination of MRI and fluorescence was studied the most extensively. These dualmodality agents can be generally categorized into the following subtypes: chemically linking Gd-chelates to fluorescent dyes [70, 71], liposomes containing Gd-chelates and fluorescent dyes [72, 73], QD-based agents [74-77], and paramagnetic nanoparticles containing fluorescent moieties [78-86]. Being perhaps the most studied molecular target for imaging applications, it is no surprise that integrin αvβ3 was also the target of interest for many of the dualmodality MR/fluorescence agents (Figure 4). Various approaches have been undertaken to construct dualmodality MR/fluorescence agents for imaging of integrin αvβ3 expression. A. An agent that contains a RGD peptide, Gd-DTPA, and a fluorescent dye. B. A PAMAM dendrimer that contains a RGD peptide, Gd-DTPA, and a fluorescent dye. 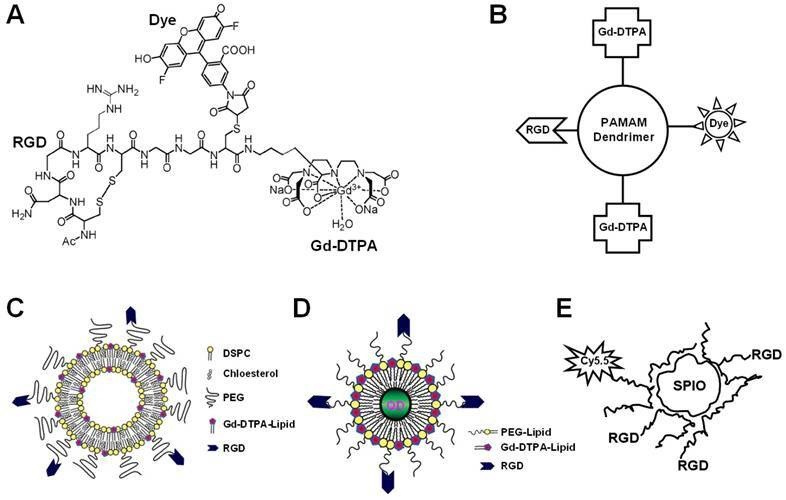 C. PEGylated paramagnetic and fluorescent liposomes containing RGD peptides as the targeting ligand. D. A QD encapsulated in a paramagnetic micelle with multiple covalently linked RGD peptides. E. A SPIO nanoparticle conjugated with both a fluorescent dye and RGD peptides. In one study, native chemical ligation was employed to synthesize an agent that contained a RGD peptide, Gd-DTPA, and a fluorescent dye Oregon Green 488 . However, in vitro and in vivo behavior of this agent has not been investigated. Due to the very low sensitivity of Gd-based MRI, such composition is not suitable for in vivo applications. Recently, polyamidoamine (PAMAM) dendrimers covalently modified with RGD peptides were constructed . Fluorescent dyes for optical imaging and chelates for Gd-based MRI, respectively, were subsequently appended to create the dualmodality imaging agents. Fluorescence microscopy revealed selective binding of the resulting RGD peptide-bearing dendrimer with empty chelates to integrin αvβ3-expressing cells, which was reduced after Gd complexation. In vivo tissue distribution of this agent in tumor-bearing mice showed mostly renal and RES accumulation, with a moderate tumor-to-blood ratio. Liposomes (usually more than 100 nm in diameter) can accommodate multiple copies of Gd and multiple copies of the targeting ligand, which can not only result in signal amplification but also in target specificity . PEGylated paramagnetic and fluorescent liposomes carrying RGD peptides have been studied for in vivo tumor imaging . Both RGD-conjugated liposomes and RAD (a control peptide which does not bind to integrin αvβ3)-conjugated liposomes gave enhanced T1-weighted MR contrast. Using ex vivo fluorescence microscopy, it was found that RGD-conjugated liposomes were specifically associated with the activated tumor endothelium while RAD-conjugated liposomes were mostly located in the extravascular compartment. This family of lipidic vehicles may potentially be used to deliver therapeutic agents, thus forming multifunctional nanoplatforms which can integrate both therapeutic components and multimodality imaging. Many nanoparticle-based agents suffer from poor tumor-to-background ratio due to the prolonged presence of contrast agent present in the blood pool [91-93]. In a recent study, the target-to-background ratio of one MR/fluorescence agent was increased by the use of “avidin chase”, which allowed rapid clearance of non-bound paramagnetic RGD-containing liposomes from the circulation . Mice bearing melanoma tumors received RGD-functionalized or untargeted biotinylated liposomes, which was followed by avidin infusion or no infusion. It was reported that besides target-associated contrast agent, the circulating contrast agent also contributed significantly to the contrast enhancement. Further, ex vivo fluorescence microscopy confirmed association of the RGD-containing liposomes to tumor endothelial cells both with and without avidin infusion, whereas biotinylated liposomes which do not contain RGD peptides were predominantly found within the vessel lumen. QD encapsulated in a paramagnetic micelle with multiple covalently linked RGD peptides was constructed . The integrin αvβ3 specificity was assessed and confirmed on cultured endothelial cells. However, in vivo targeted imaging of this agent has not been achieved with either MRI or optical imaging. Silica particles have quite favorable biocompatibility, which may be significantly improved by appropriate surface modification [95, 96]. In one study, silica nanoparticles carrying a QD in the center and multiple RGD-peptides on the surface were reported . Specific uptake of the nanoparticle by endothelial cells in vitro was demonstrated with both fluorescence microscopy and MRI. In another report, a RGD-containing nanoparticle, with a blood half-life of 3 h, was found to be able to escape from the vasculature over its long circulation time and target integrin αvβ3 expressed on tumor cells . Recently, the use of a QD-based nanoparticle for both optical and MRI detection of tumor angiogenesis was described . Upon intravenous injection into tumor-bearing mice, intravital microscopy allowed the detection of angiogenically activated endothelium at cellular resolution with a small scanning window and limited penetration depth, whereas MRI was used to visualize angiogenesis at anatomical resolution throughout the entire tumor. In another study, IO nanoparticles coated with amphiphilic triblock copolymers were conjugated with a NIRF dye and cyclic RGD peptides for integrin αvβ3 targeting . Successful tumor homing in vivo was achieved in a subcutaneous U87MG glioblastoma xenograft model with both MRI and NIRF imaging. Most of the dualmodality imaging agents reported so far are based on certain nanoparticles. The use of molecularly targeted nanoparticles affords many advantages over conventional small molecule-based approaches for integrin αvβ3 imaging. First, hundreds, thousands, or even more imaging labels, or a combination of labels for different imaging modalities, can be attached to a single nanoparticle which can lead to dramatic signal amplification. Second, multiple, potentially different, targeting ligands on the nanoparticle can provide enhanced integrin αvβ3 binding affinity/specificity. Third, the ability to integrate various means to bypass biological barriers will give enhanced targeting efficacy. Ultimately, the combination of different targeting ligands, imaging labels, therapeutic drugs, and many other agents may allow for effective and controlled delivery of therapeutic agents in patients which can be non-invasively and quantitatively monitored in real time. Several barriers exist for in vivo applications in preclinical animal models and future clinical translation of such multifunctional/multimodality nanoparticles, among which are the biocompatibility, in vivo kinetics, integrin αvβ3 targeting efficacy, acute and chronic toxicity, the ability to escape the RES, and cost-effectiveness. One intriguing phenomenon is that the abovementioned agents are mostly for dualmodality MR/fluorescence imaging applications, which is due to the exploding interest in IO nanoparticles and QDs over the last decade [41, 101]. However, most of these agents are not ideal/suitable for in vivo applications. More importantly, it is debatable whether combination of MRI and fluorescence is the most optimal dualmodality approach since neither modality is quantitative. Molecular MRI is still in its infancy  and dualmodality imaging including MRI is relatively rare. Nanoparticles usually suffer from poor extravasation when compared to small molecules or proteins [19, 44, 103]. Thus, the feasible targets reachable by targeted nanoparticles (the basis of most dualmodality imaging agents) will be mostly vasculature-related, as the overall hydrodynamic diameter of these nanoparticles with surface polymer coating and targeting ligands are quite large (typically > 20 nm in diameter) which prohibits extravasation. As a matter of fact, this is one of the major reasons why integrin αvβ3 is the most popular target for dualmodality molecular imaging, since it is expressed not only on tumor cells but also on many sprouting vessels thus extravasation is not required to achieve tumor contrast. Newly developed nanoparticles with smaller sizes (preferably < 10 nm in diameter) and longer circulation half-lives (at least a few hours) may allow for extravasation from the leaky tumor vasculature to a certain extent. Since the major disadvantage of MRI is its inherent low sensitivity, which is exacerbated by almost exclusively vasculature targeting, future development of novel contrast agents with the capability of targeting the tumor cells in addition to the vasculature may dramatically increase the MR signal and facilitate the biomedical applications of dualmodality imaging agents targeting integrin αvβ3. Dualmodality contrast agents that combine radionuclide-based imaging (PET or SPECT), which is very sensitive and highly quantitative, and non-radionuclide based approaches, for example optical imaging which can significantly facilitate ex vivo validation of the in vivo data or MRI which can provide high resolution anatomical information, should be of particular interest for future biomedical applications. PET has significantly higher sensitivity than SPECT . Therefore, PET/fluorescence and PET/MR contrast agents deserve much research effort in the near future. One scenario where a dualmodality approach will be particularly useful is that an initial whole body PET scan can be carried out to identify the location of tumor(s), and the optical component can subsequently help pinpointing the position during surgery for tumor resection. Contrast agents that can be detected by more than two imaging modalities are also expected to emerge in the future. Although various combinations of different imaging modalities can serve different purposes depending on the study design, we envision that a PET/MR/fluorescence agent will find the most future biomedical/clinical applications since such a combination provides extremely high sensitivity (PET), quantitation capability (PET), excellent anatomical information and soft tissue contrast (MRI), as well as a means for ex vivo validation (optical) which itself can also be useful for highly sensitive imaging in certain sites of the human body. Recently, one such multimodality probe was reported . However, no targeting ligand was incorporated and in vivo imaging was only achieved with PET (but not with optical imaging or MRI) due to its much better sensitivity and tissue penetration. Big strides have been made over the last decade for imaging integrin αvβ3 expression and several PET/SPECT probes have been tested in human studies [106-109]. For dualmodality and multimodality imaging applications, many critical proof-of-principle studies have been reported which opened up many new avenues for future research. We expect that the next decade will witness further growth and continued prosperity of molecular imaging studies focusing on integrin αvβ3, which we believe will eventually make significant impact on clinical patient management. The authors acknowledge financial support from the UW School of Medicine and Public Health's Medical Education and Research Committee through the Wisconsin Partnership Program, the University of Wisconsin Carbone Cancer Center, a Susan G. Komen Postdoctoral Fellowship and a DOD PCRP IDEA Award. Corresponding author: Weibo Cai, PhD, Departments of Radiology and Medical Physics, School of Medicine and Public Health, University of Wisconsin - Madison, 1111 Highland Avenue, Room 7137, Madison, WI 53705, USA. Phone: 608-262-1749; Fax: 608-265-0614; Email: wcaiorg.